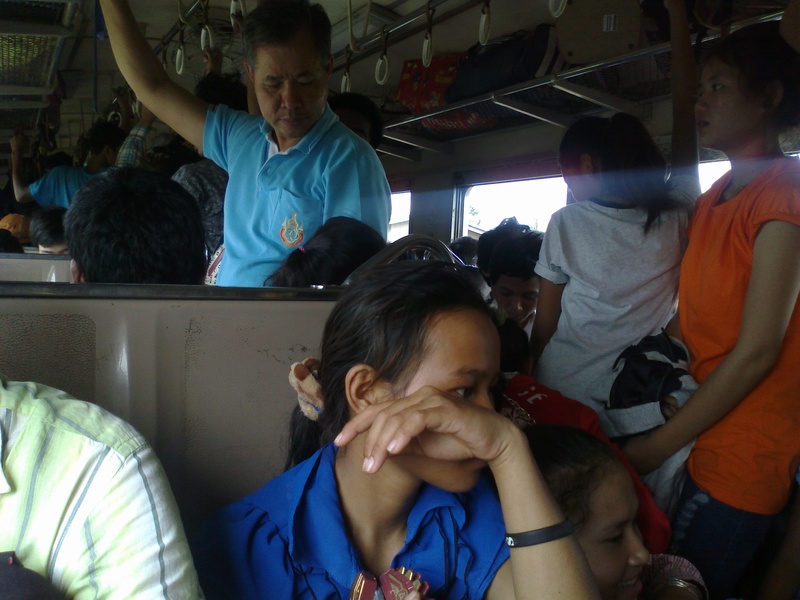 The train from Bangkok to Aranyaprathet on the Cambodian border seems unusually crowded. My British friend Tom and I are lucky to get a seat, and we’re both trying to figure out why—maybe because it’s Friday? Or maybe it’s a holiday. Whatever, by the time we’ve reached the BKK airport on the skirts of town, the train has long been full to capacity, and nobody’s getting off, with still more trying to get on. Nobody seems angry, though, as if this were to be expected. I assume it’s because the ride is free for locals. That means people can ride whether they have any business or not, just joy-riding, so to speak. Still, no one’s getting off—anywhere. They can’t all be going to the border, can they? Aranyaprathet is not that large of a town. Unless they’re Cambodian (what is the sound of one light-bulb lighting?). Our seatmates are silent the whole trip, pretty strange for Thais, not known for their pensive moments. They’ve got tickets, though; locals wouldn’t need them. We finally get to Aranyaprathet, only an hour late on a five-hour ride—not bad—and the just train shuts down, period, lights out. That’s weird. People start getting off, then stop. Some go out the windows. Tom thinks we haven’t even arrived yet, but I know we have. It’s a traffic jam out there—literally—people traffic, jamming the platform. We finally thread our way through forward cars, wherever there is empty space, until finally we can see the station, and a path to it through hundreds of carefully seated people. It’ a traffic jam alright—human trafficking, illegal labor. But I didn’t know all that then. I read the news later. 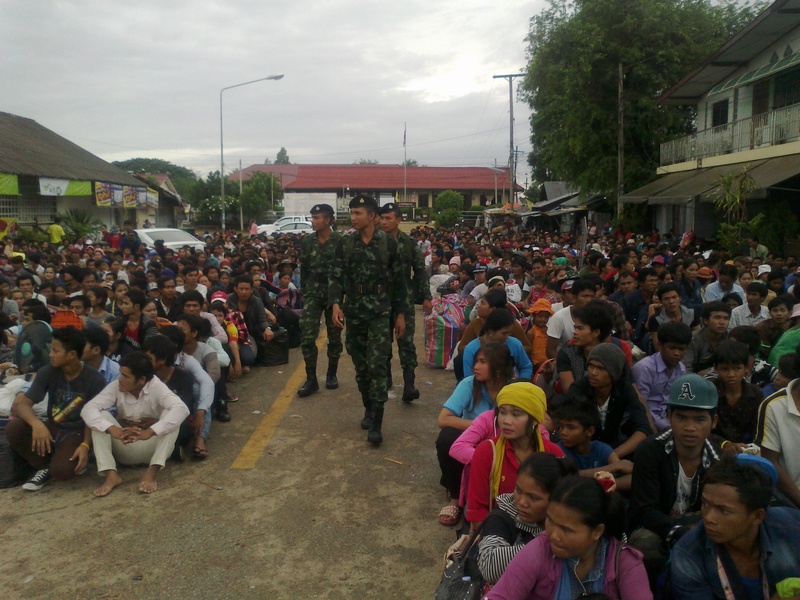 The army junta is cracking down, or threatening to, anyway, and Cambodians are running scared, literally, running for their lives. Apparently they’re running right into the arms of the dog-catchers, waiting there with open arms, and trucks, personnel carriers, so to speak. I go back the next morning to see the mop-up. It isn’t pretty, those same people now seated on the asphalt entrance to the train station in front, my fellow passengers from the day before. I doubt they’ve slept, or eaten, or sh*t.
Trucks soon begin arriving to carry them off, presumably to the border only a couple miles away. You’d think that people who’d just independently ridden a train for six hours would be allowed the dignity of a walk to the border without the Gestapo and trucks. I guess not. These are the descendants of the builders of Angkor Wat, the progenitors of much of what Thai culture itself borrowed. There is no shortage of irony here. But this is nothing. You should see how fishing boat slaves are treated. That was an adventure for sure – and so well described and pictured for us to see with our mind’s eye. Tonight at the Capitol Club 250 Brandonians are attending the BHS Grand Reunion for the 10 classes of the 60s. Sherri and her husband, Tom, have been here from Nashville for three days.